As the son of a builder, Tony Turton has the building and construction industry in his genes, and he brings that legacy and passion to every project he takes on. The combination of the tricks of the trade he picked up from his father and his own university degree in the field of architecture and drafting gives Tony a unique breadth of industry know-how and expertise. After completing university, Tony completed his education by working in the frame and truss world to improve his hands-on training. After experiencing many aspects of the building industry first-hand, Tony was ready to start the process of founding his own company. He worked hard to obtain his building license and put his dream into motion by setting up his first company, Double T Constructions. Starting off as a small deck and renovation company, Tony built Double T Constructions into a full-fledged building company, focusing on projects in both the residential and commercial sectors. Coming full circle, Tony eventually hired on his own father as a member of the Double T building team. Ready to move onto something new, Tony sold Double T Constructions and began to search for new opportunities. Wanting to focus on his love of building decks and doing smaller renovation projects where he could maintain close involvement with his clients, Tony founded the now well-known I’ll Deck You brand. Between his architecture background and natural design flair, Tony became known for his ability to provide exceptional solutions to cater to his customer’s individual needs as well as a focus on keeping it real from both a budget and a construction perspective. 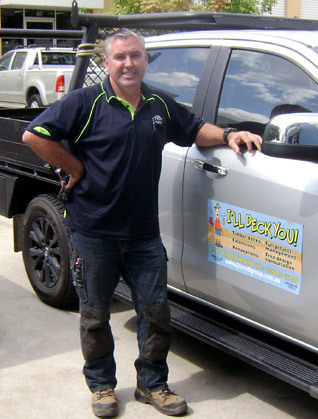 Over the years I’ll Deck You has achieved much success and has earned a solid reputation in the inner north region of Brisbane for Tony’s expert work and impeccable customer service. The scale of the company also allows Tony to spend quality time with his wife and two children and make time for dirt biking, his only passion that competes with his love of building. But Tony is never one to sit still. Recently a number of unexpected business opportunities presented themselves and Tony felt compelled to act. In conjunction with I’ll Deck You, Tony has formed the Inov8 group, whose focus has been spread across the commercial, new home, and large renovation markets. This new venture has been very successful and already has a number of significant jobs under its belt. Tony has formed specific internal structures for both building arms and continues to be a driving force in both I’ll Deck You and Inov8. In addition to building great structures, Tony continues to pride himself on providing all our clients with the personalized service that one would expect from a solid family-owned business.